Sealaska Heritage Institute (SHI) is accepting applications from artists who want to compete in its eighth biennial Juried Art Show and Competition, which will expand to include new divisions and a youth show. 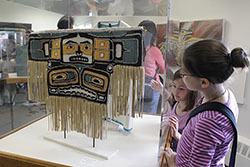 SHI will award prizes in five divisions: Carving and sculpture, which includes categories for wood, metal and other media carvings; sewing, which includes categories for skin and fur, beadwork and button blankets; weaving, which includes categories for Chilkat, Ravenstail and basketry; two-dimensional and relief carving, which includes categories for paintings, drawings and relief carving; and endangered art, which includes categories for spruce root weaving and mountain goat horn spoons. The institute revamped the program at the recommendation of its Native Artist Committee and artists who participated in SHI’s Native Artist Gathering this year. In most art competitions sponsored by SHI in the past, artists have competed in the categories of traditional and contemporary art. Jurors have struggled to judge between two fundamentally different art forms, such as a spruce root basket and a paddle. With the new structure, jurors will be able to judge similar pieces and choose objects that show the highest level of artistry and technique. SHI added an endangered art division to highlight the need for more artists to focus on art forms in this category and to encourage artists to acquire skills to perpetuate art practices that are endangered. SHI also will sponsor a youth show for young artists. The Juried Art Show and Competition is held during Celebration, SHI’s biennial festival which is scheduled June 8-11, 2016. SHI will unveil the pieces accepted for exhibit on June 8, and the show will run for two months at the Walter Soboleff Building. To keep collections safe at the new Walter Soboleff Building, SHI follows standard museum practices in preparing objects for exhibit, which means any artwork selected for the show must arrive earlier than in previous years. The deadline to apply for the Juried Art Show and Competition is Feb. 17 and pieces accepted into the show must arrive at SHI by April 1. SHI will open the youth show on June 3 at the Juneau Arts and Culture Center, and winners will be announced on June 8 during the awards ceremony for the Juried Art Show and Competition at the Walter Soboleff Building. The deadline to apply for the youth show is April 15, and SHI will post the application online soon.